With a loud roar and mighty column of flame, NASA and ATK Aerospace Systems successfully completed a two-minute, full-scale test of the largest and most powerful solid rocket motor designed for flight. The motor is potentially transferable to future heavy-lift launch vehicle designs. The stationary firing of the first-stage development solid rocket motor, dubbed DM-2, was conducted by ATK, a division of Alliant Techsystems of Brigham City, Utah. DM-2 is the most heavily instrumented solid rocket motor in NASA history, with a total of 53 test objectives measured through more than 760 instruments. Although similar to the solid rocket boosters that help power the space shuttle to orbit, the five-segment development motor includes several upgrades and technology improvements implemented by NASA and ATK engineers. Motor upgrades from a shuttle booster include the addition of a fifth segment, a larger nozzle throat, and upgraded insulation and liner. The motor cases are flight-proven hardware used on shuttle launches for more than three decades. The cases used in this ground test have collectively launched 59 previous missions. After more testing, the first-stage solid rocket motor will be certified to fly at temperature ranges between 40-90 degrees Fahrenheit. The solid rocket motor was built as an element of NASA’s Constellation Program and is managed by the Ares Projects Office at Marshall. ATK Aerospace Systems is the prime contractor. A University of Tokyo group of researchers, led by bioengineer Shoji Takeuchi, have made an electronic sensor capable of smelling gases. The sensor uses genetically engineered frog cells. Since previous sensors were not very accurate, the scientist decided to try a biological approach. The invention was revealed in a US scientific journal yesterday, and is supposed to be used to design better machines to detect polluting gases in the atmosphere. 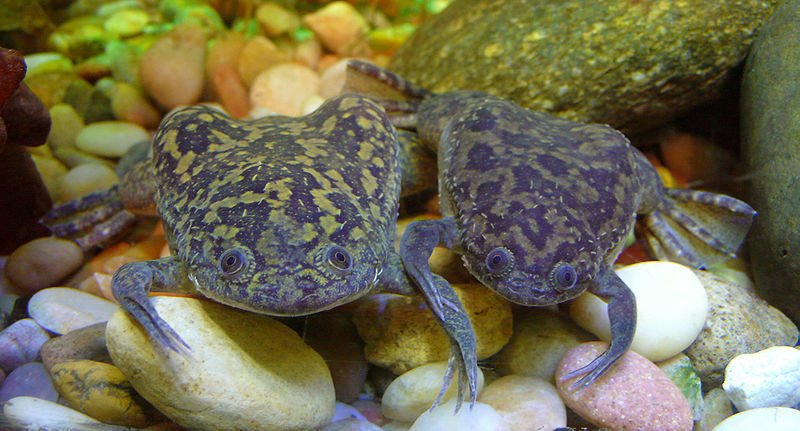 Two African clawed frogs Xenopus laevis. Image: TimVickers. Genes of several insects (the silk moth, diamondback moth and fruit fly), injected into African clawed frog Xenopus laevis eggs, allowed them to produce relatively inexpensive and useful sensors. The choice of the species was caused by their widely studied and well-understood protein expression mechanism. The modified cells responded to three kinds of pheromones and one odourant, which have similar chemical properties. When a molecule of an odorous substance adhered to the receptor on the membrane protein, ion channels opened for a certain period of time, and a current was generated. Its magnitude was clearly different for all four tested substances, allowing to distinguish between them accurately. The colleagues embedded the sensor into a mannequin, so that it could shake its head when a gas was detected. It was easier to observe. Pheromones and molecules with quite similar molecule structure produced clearly distinguishable reaction, with higher accuracy than other biological or human-made sensors. As the research group said, the detection sensitivity of the odor sensor is several tens of parts per billion (ppb), and it is as high as the sensitivity of an existing odor sensor that uses an oxide semiconductor. The distinctive feature of the new sensor is its capability to selectively detect some odorous substances, rather than its sensitivity. Very few false positives were possible due to the biological mechanism involved. At normal temperature, the sensor lifetime is about 12 hours, which can be extended by putting it into a refrigerator before first use. Mount Sinabung has erupted in Sumatra, Indonesia, spitting smoke and ash 1,500 meters (4,921.3 ft) in the air at 00:08 local time Sunday. 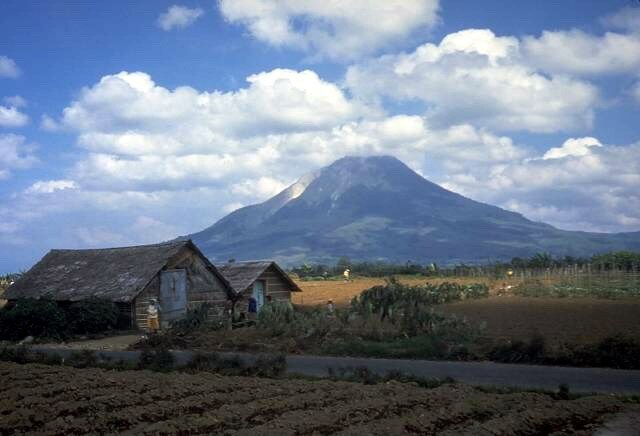 Sinabung has been long dormant for over 400 years and it has been spewing smoke since Friday, according to residents (pictured 1987). Image: Tom Casadevall, USGS. “The situation is under control. Emergency response teams are already on the scene,” says a spokesperson for the Indonesian National Disaster Management Agency. Saturday, Sinabung was spewing smoke, however, the volcano was not expected to erupt, according to the directorate. Around 12,000 residents have been evacuated from the area. One person has died. This is the first reported eruption since 1600. University of East Anglia researchers led by Dr Matt Hutchings have discovered that leafcutter ants deploy several antibiotics to protect fungi they grow as food for their queen and larvae. It is the first time ants have been found using more than one antibiotic in combination. The new antibiotics discovered have anti-fungal effect, and can be useful for modern medicine. UK Medical Research Council funded the investigation. Leafcutter ant Acromyrmex octospinosus on a stick carrying a leaf Image: Deadstar0. The health of a certain type of fungus gardens is vital for the ants colony since the fungus is used to feed larvae and the queen. The antibiotics act both as herbicides and regulators of fungus growth. The antibiotics are produced by actinomycete bacteria, which live in a state of symbiosis with the ants, and are found on the bodies of the ants themselves. The symbiotic relationships benefit both the ants and the bacteria. A former Filipino policeman has kept Hong Kong tourists hostage by hijacking their bus in Manila, the capital of the Philippines. 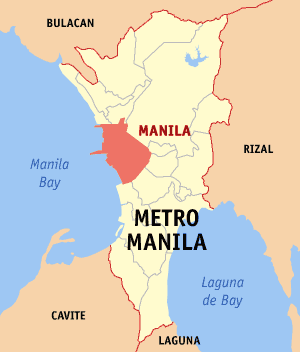 Rolando Mendoza fired his M16 rifle at the tourists. Several hostages have been rescued and least six have been confirmed dead so far. Six hostages, including the children and elderly, were released early, as were the Filipino photographers. The photographers later took the place of an aged lady as she needed the lavatory. Mendoza was gunned down. Mendoza was fired from the Police Force after robbery and drugs claims. His brother explained that ‘his problem was he was unjustly removed from service. There was no due process, no hearing, no complaint.’ Both government officials and his brother had tried to negotiate with him to release the hostages. Mendoza stuck handwritten notes on the bus. One threatened that a ‘big deal’ would happen after 3pm; another said ‘Big mistake to correct a big wrong decision’. Yet another attempted to catch the attention of the media. Gunshots were heard inside the bus and Mendoza was shot down. The police rescued the hostages on the bus. The number of survivors totalled seven. Eight were confirmed dead. The Hong Kong government discussed with Hong Thai Travel and decided to send a plane to take the survivors back to Hong Kong. Ambrose Lee led an ad hoc group to deal with the incident. One police officer and one Immigration Department officer of Hong Kong flew to Manila to help.